Confined spaces are those that are large enough to enter and perform work inside; have a limited or restricted means of entry or exit; and yet are not designed for continuous human occupancy. They’re found in industrial settings, commercial facilities, hospitals, universities, and even on farms – and include various types of tanks, cargo holds on ships, silos, utility vaults, boilers, sewer and water manholes, elevator shafts, dumpsters, tunnels, and more. Death and injuries result from entrapment and drowning due to asphyxiation and toxic chemical exposure. In many of these incidents, it is not just the person entering the confined space who dies, but also the “rescuer” who may be unaware of the hazard. NFPA research indicates that fire departments conducted an average of 580 confined space rescues per year during 2014-2016. Confined space emergencies are rare, high-risk incidents. When they do happen, they can lead to firefighter injuries or deaths. First responders must be aware of the hazards and limitations of confined spaces so they can be prepared when they approach an incident in or around a confined space, and when they attempt to enter confined spaces during non-emergencies. Pre-incident emergency action plans should be developed to prepare first responders for safe practices associated with rescue from specific and generic confined spaces. This action guide provides a list of considerations for first responders to review when responding to a confined space incident. Workers entering or working in confined spaces often face life-threatening hazards and by law, employers must comply with applicable OSHA regulations. 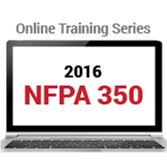 Learn how to recognize, evaluate, and control hazards in confined spaces with the NFPA 350: Safe Confined Space Entry and Work Online Training Series. NFPA Certificated Marine Chemists are holders of a valid Certificate in accordance with the Rules for the Certification and Recertification of Marine Chemists, establishing they are qualified to determine whether entry and work within confined spaces on marine vessels and within shipyards may be undertaken safely in accordance with NFPA 306. NFPA Marine Chemists are distinguished as the only independent specialists incorporated by name in both U. S. Department of Labor (OSHA) requirements for shipyard employment and U. S. Coast Guard hot work regulations. The 3-day training seminar is based on OSHA’s maritime confined space standard, 29 CFR 1915, Subpart B and NFPA 306. NFPA Journal® article: Tight Spot - To address a galaxy of hazards related to confined spaces, NFPA creates a new guide for safe confined space entry and work, March/April 2017; Sidebar: Hazards Everywhere. NFPA Journal column: When does a concealed space require sprinkler protection? July/August 2018. NFPA blog:If the 911 call comes in for a confined space incident – are you prepared to respond? OSHA article: Why use NFPA 350, Guide for Safe Confined Space Entry and Work?